Carter Aviation is a Texas-based firm that develops “Slow Rotor/Compound technology (SR/C™)” for vertical take off and landing aircraft that combines with the efficiency of a fixed-wing airplane with the vertical take-off ability of a helicopter. 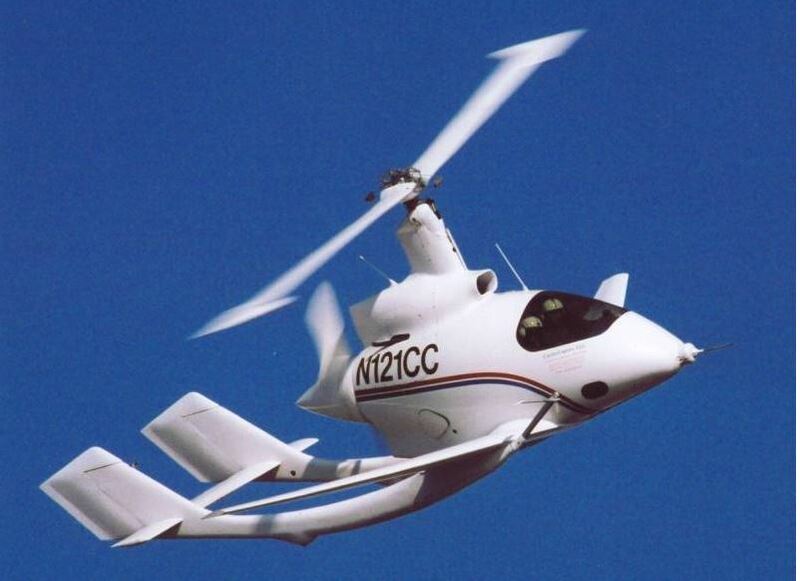 Carter debuted its first VTOL prototype in 1998. Now, it has released concept images of its newest eVTOL design in line with Uber Elevate’s specifications for future air taxis. Carter Aviation’s design is unique in that it is one of the only fixed wing eVTOLs to feature a single lift rotor rather than distributed electric propulsion (IDEP). It does not directly address why it has made the single rotor design choice as opposed to IDEP but does note the “unparalleled safety of a high inertia rotor”. It’s notable that the company first began prototyping as far back as 1998, and prides itself mainly on its’ SR/C™ technology which it claims has a higher speed, cruise efficiency, and safety than other similar aircraft. 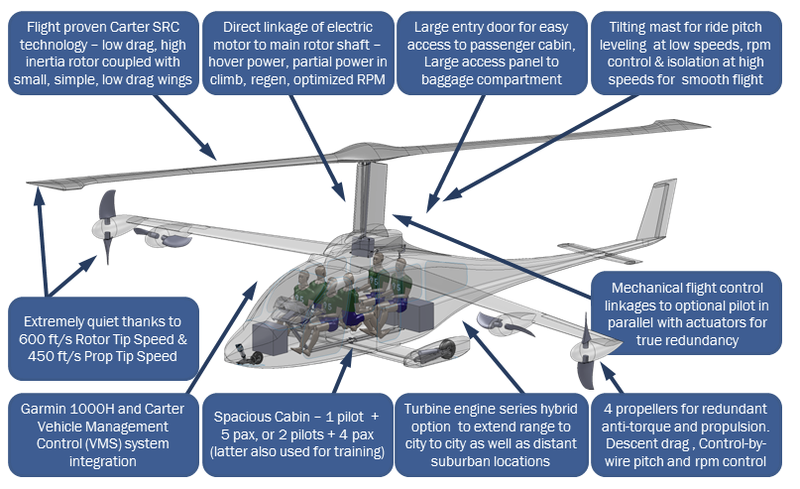 The single-rotor design is particularly significant as one of the reasons for special for certification requirements in Europe is that many of the new aircraft concepts such as the Vertical Aerospace eVTOL use a “distributed lift/thrust units to generate powered lift and control”. Carter’s ‘Electric Air Taxi’ design features a 5 passenger capacity, a 175 mph cruise speed, and a battery range of 60 miles. These specifications are built to Uber Elevate requirements. It’s slowly turning rotor, a design edge unique to Carter, make it much quieter than traditional helicopters, and can act as a built-in parachute. The vehicle cruises between 1,000ft to 2,000ft and re-charge in 5 minutes. Why it’s import: Companies everywhere are gearing up to partner with Uber for future on-demand air mobility. 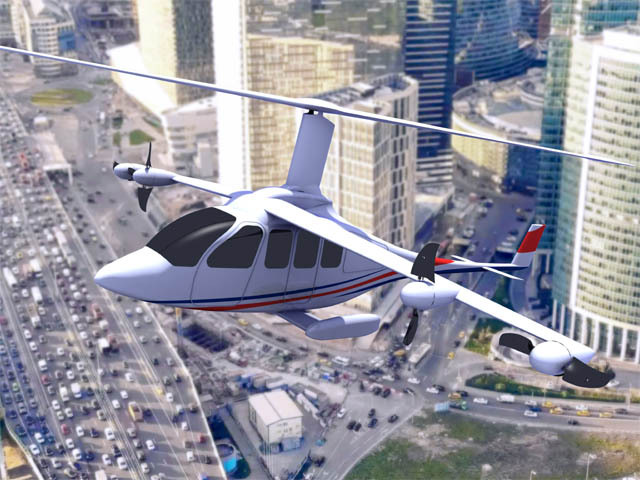 Carter Aviation is a long-time expert in combining fixed wing and vertical lift technologies, and may an aircraft we one day see in operation with Uber. While Uber has selected certain companies to work with including Karem Aircraft, Boeing’s Aurora Flight Sciences, and Bell, and has developed its own models of potential aircraft, it may eventually take on other partners as well, or, as it needs more and more aircraft, outsource to companies like Carter.